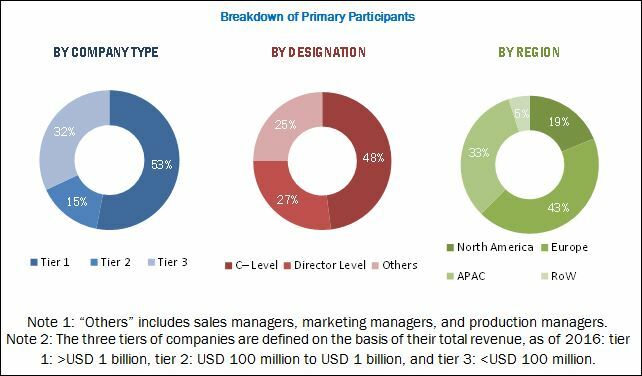 [154 Pages Report] The aerospace & life sciences TIC market is expected to increase from USD 28.77 Billion in 2016 to USD 41.60 Billion by 2023, at a CAGR of 5.34% between 2017 and 2023. Study the complete value chain and allied industry segments, and perform a value chain analysis of the aerospace & life sciences TIC services landscape. During this research study, major players of the aerospace & life sciences TIC ecosystem in various regions have been identified, and their offerings, regional presence, and distribution channels have been understood through in-depth discussions. To find the overall market size, top-down and bottom-up approaches have been used to estimate the market size of other individual markets by using percentage splits from secondary sources such as D&B Hoovers, Bloomberg Business, Factiva, and OneSource, as well as primary research. The entire procedure includes the study of the annual and financial reports of the top market players and extensive interview of industry leaders such as CEOs, VPs, directors, and marketing executives for key insights (both qualitative and quantitative) pertaining to the market. The following figure shows the breakdown of the primaries on the basis of the company size, designation, and region conducted during the research study. The ecosystem of the aerospace & life sciences TIC market comprises a network of regulatory bodies, accreditation and standards organizations, third-party aerospace & life sciences TIC service providers, Research and Development (R&D) institutions, manufacturers, technology integrators, and distributors. Key companies in the aerospace and life sciences TIC market are SGS (Switzerland), Bureau Veritas (France), Intertek (UK), DEKRA (Germany), and TÜV SÜD (Germany). Prominent companies in the aerospace & life sciences TIC market includes the well-established, financially stable, and technical strong players that have been operating in the industry for several years and have diversified product portfolios, proprietary technologies, and strong distribution networks through collaborations and acquisitions. The aerospace & life sciences Testing, Inspection, and Certification (TIC) market is expected to increase from USD 30.45 Billion in 2017 to USD 41.60 Billion by 2023, at a CAGR of 5.34% between 2017 and 2023. The growth of this market is mainly driven by growing consumption of goods in emerging countries, increasing incidents of product recalls globally, the surge in global counterfeiting and piracy activities, and the imposition of rigorous government regulations and standards across various sectors. 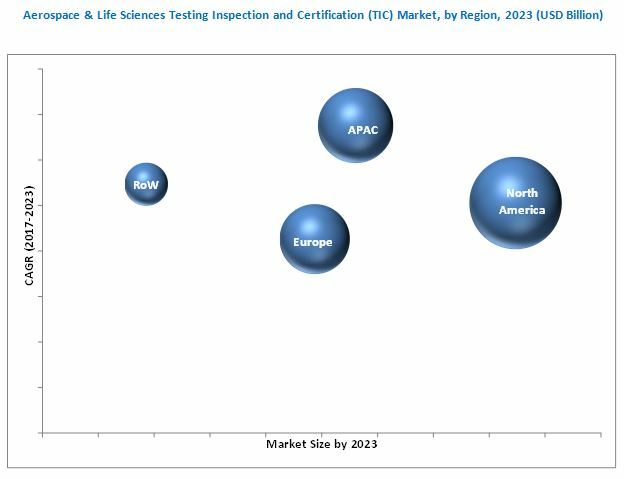 The aerospace & life sciences TIC market for testing services accounted for the largest share in 2016. There is an increasing demand for testing services in most applications owing to the rising demand for good-quality and standard products across the industry. Manufacturers are required to ensure the products have met the quality, technical, safety, and performance regulatory standards to increase the marketability of their products. The aerospace & life sciences TIC market for in-house sourcing type accounted for the largest share in 2016. Earlier, manufacturers and organizations had to adhere to limited standards and regulations; hence, it was possible for companies to build their in-house testing and inspection capabilities. In recent years, the standards pertaining to human/user safety and environmental safety have increased and become mandatory for certain category of products. The aerospace & life sciences TIC market for the medical & life sciences application held the largest share in 2016. The medical & life sciences industry is subject to a variety of stringent regulations, standards, and legislation. The medical & life sciences application includes medical devices, health, beauty & wellness, clinical services, laboratory services, and biopharmaceutical and pharmaceutical services. These industries are required to meet the highest levels of safety and reliability for the safety of consumers and assets. By region, North America accounted for the largest share of the aerospace & life sciences TIC market in 2016, owing to increased demand from export-oriented developed economies and the high quality and standard of medical devices from the region. North America also invests heavily in the aerospace and healthcare sectors. Major application of TIC services in these countries include medical devices, clinical services, and laboratory services. These applications have a significant demand for aerospace & life sciences TIC services, which would help them to comply with international standards. Divergent standards and regulations across geographies is the restraining factor for the growth of the aerospace & life sciences TIC market. SGS (Switzerland) is one of the leading companies in the aerospace & life sciences TIC market, followed by Bureau Veritas (France). SGS is highly focused on its continued growth through acquisitions, strategic partnerships, and expansions to gain a competitive advantage. Bureau Veritas focuses on acquiring small companies. It has acquired more than 100 companies in the past 10 years. *Details on Business Overview, Services Offered, Strength of Service Portfolio, Business Strategy Excellence, Recent Developments, Key Relationships Might Not Be Captured in Case of Unlisted Companies.